“Half the pleasure of a visit to Big Bend National Park, as in certain other affairs, lies in the advance upon the object of our desire”. Sunday, February 6th, through Tuesday, February 8th, 2011—Big Bend National Park: We are very excited to finally get to this National Park. Folks that have followed our travels over the past two years may remember we wanted to visit Big Bend however something always seemed to cause us to alter our plans. 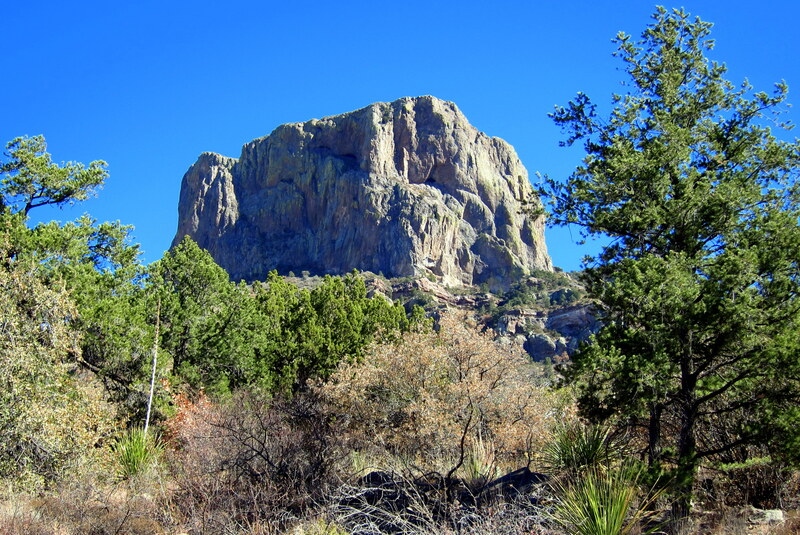 Big Bend is the 15th largest park in the system and is very remote. There is virtually no way to just drive through on the way to somewhere else. 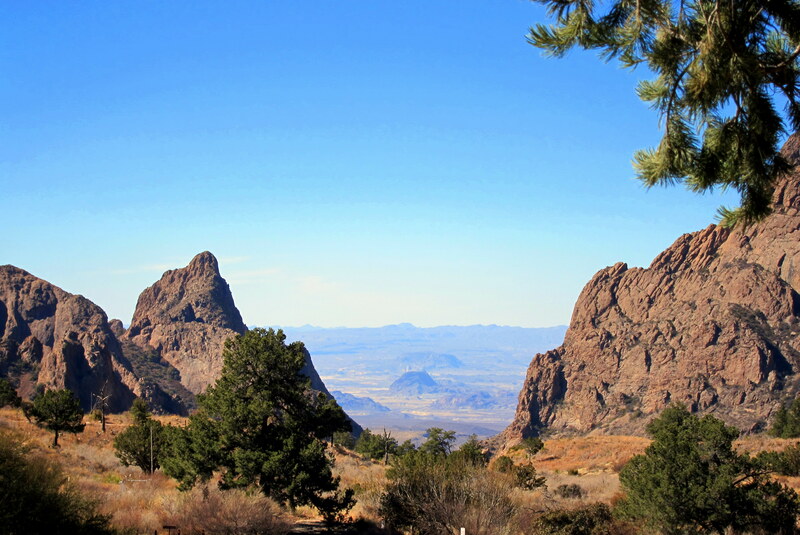 It takes a committed traveler to venture off of US-90 and find their way to Big Bend. The road leading to the park is miles and miles of miles and miles and one encounters not one town on the long journey. 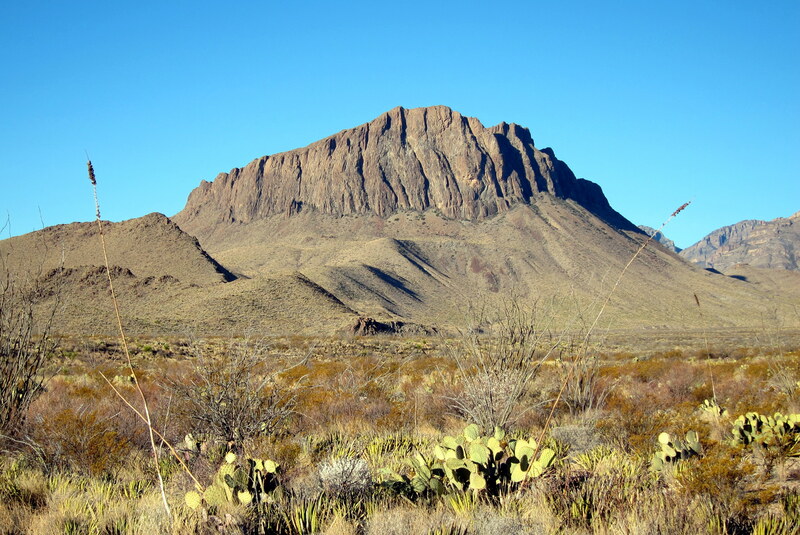 Big Bend has a unique topography. 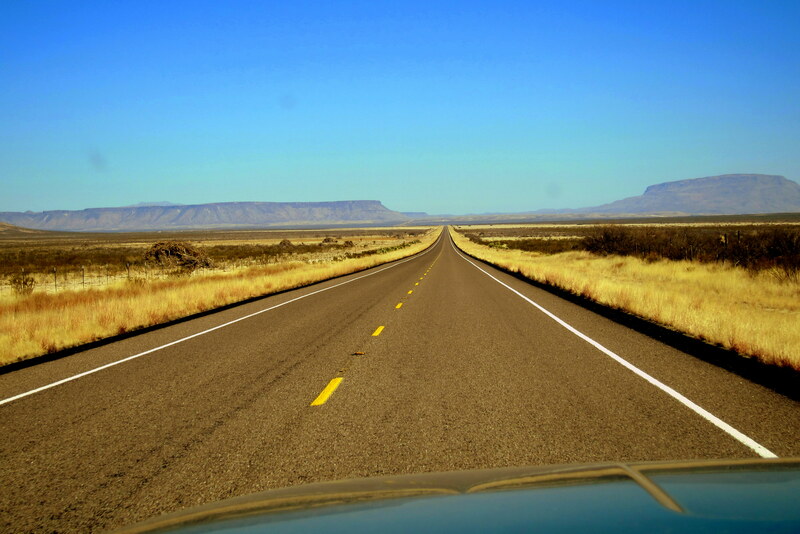 The altitude ranges from 1,850 feet along the Rio Grande to over 7,800 feet at its highest elevation. There are 180 miles of dirt roads to explore and another 200 plus miles of hiking trails. The weather can range from the 20’s in the winter to over 100 degrees in the summer. 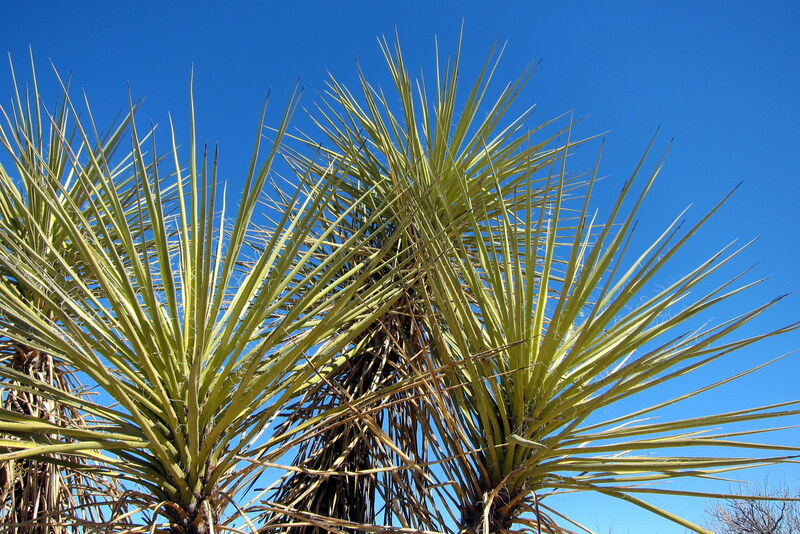 It is one of the most unique and diverse National Parks in the system ranging from the Chihuahuan Desert lowlands to its lofty mountain peaks featuring many hardwood trees and often, during the winter, snow. A historically active seismic area, there are a good many features in the park made up of the solidified magma. These “monuments” have emerged over many years by the action of wind and water constantly eroding the softer surrounding material. 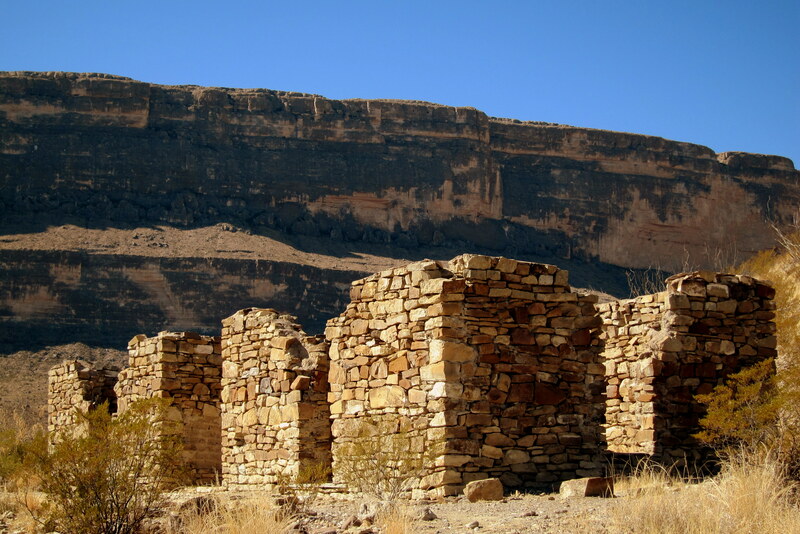 The Big Bend area has been home to native people long before there was an official border. American and Mexican peoples would freely move about this area in guarded mutual recognition. Later farmers and ranchers settled the area and freely moved back and forth across the river to hunt and trade. The National Park was established in 1944 while World War II raged around the globe. 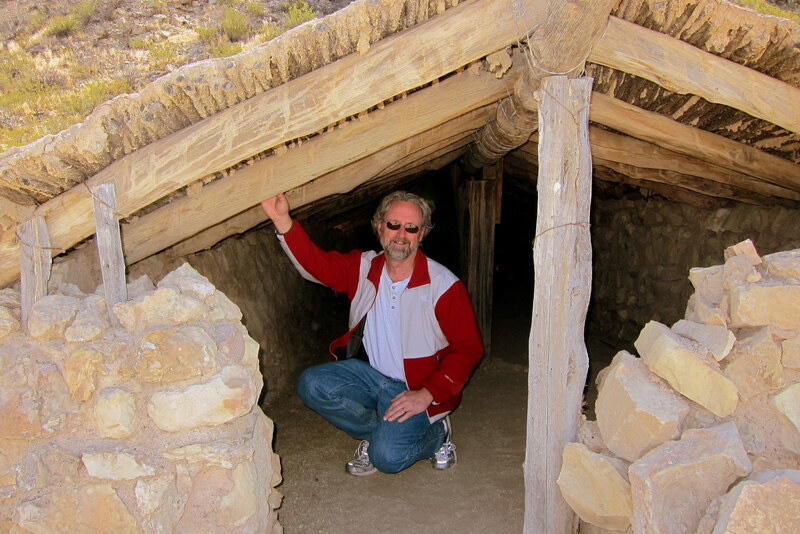 Many old homesteads and ranchers huts survive in this arid dessert environment and are accessible for exploration. One such place is this small “Jacal” where Gilberto Luna raised a large family until his death in 1947 at 108 years old. 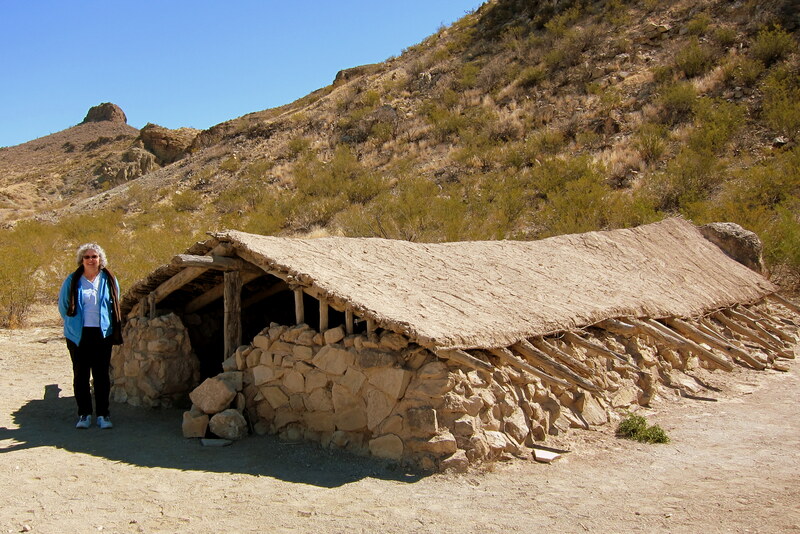 The long low purpose built home is made of dried Ocotillo covered with mud plaster, a technique called “Wattle and Daub”. There is little headroom but the structure is reported to stay warm in the mild winters and a good 20 degrees cooler than the surrounding desert in the heat of summer. Back at camp one morning we were lounging around enjoying the beautiful weather and noticed this sprightly fellow come running by. We were both alarmed that at any minute a large iron anvil would drop from the sky. Then we realized that there hadn’t been any packages delivered from The Acme Corporation in recent days so the likelihood of being squashed by an anvil was remote. 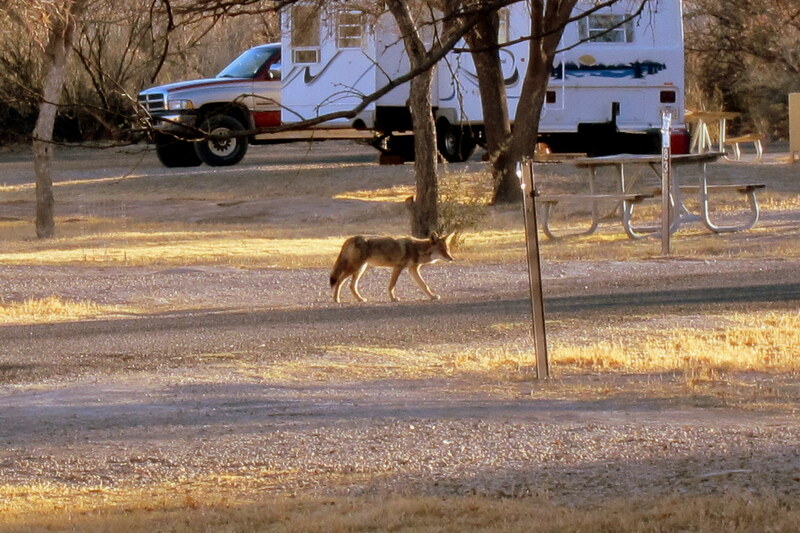 As usual, the Roadrunner out maneuvered the Coyote even though Wily was wearing his rocket backpack. The bird then emitted the unique roadrunner call that all seasoned ornithologist recognize—MEEP, MEEP! However he then did a curious thing. The little bird stopped about 6 feet from our location, turned his back to the sun and puffed out his plumage for a few seconds. This may have been the birds attempt to warm his body in the rather cool morning. Or it may have been his victory dance as the wily Coyote careened off an adjacent cliff and hung in midair for a few seconds before plummeting to the valley below and landing with a small puff of dust. Either way, it was an interesting sight. Boy I love nature! 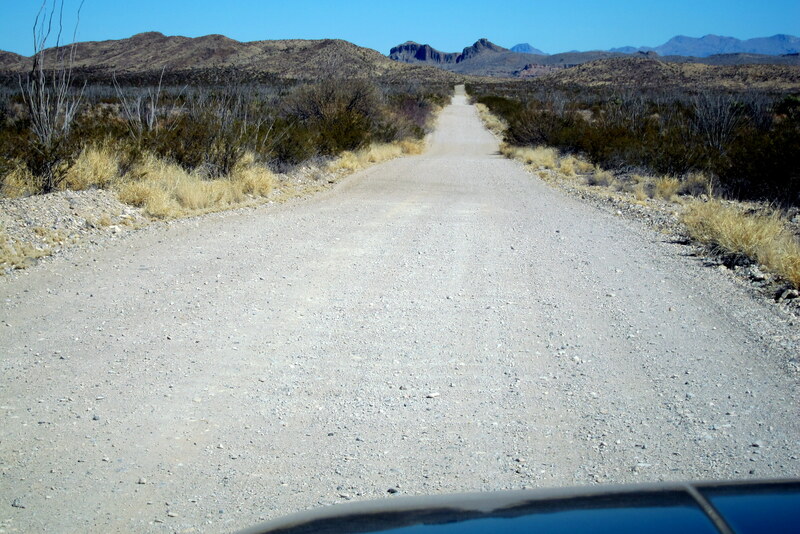 We spent lots of enjoyable hours exploring the interior of the park by way of the many dirt roads that lace the area. On many of these abandoned roads there are the ruins of ranching huts. Cattlemen would spend days on the open range tending to their herd and would find shelter in these isolated huts. 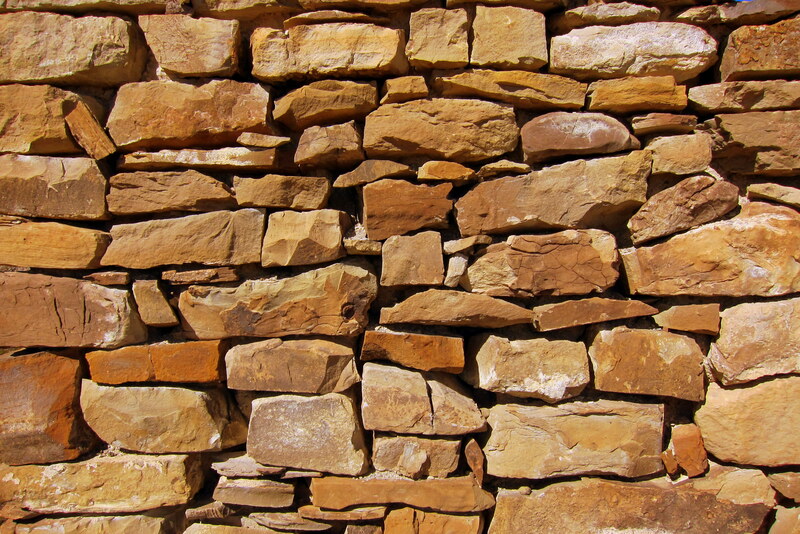 The dry stack wall construction of a century ago is still holding up with virtually no maintenance. How would your modern home look, if it were treated the same? 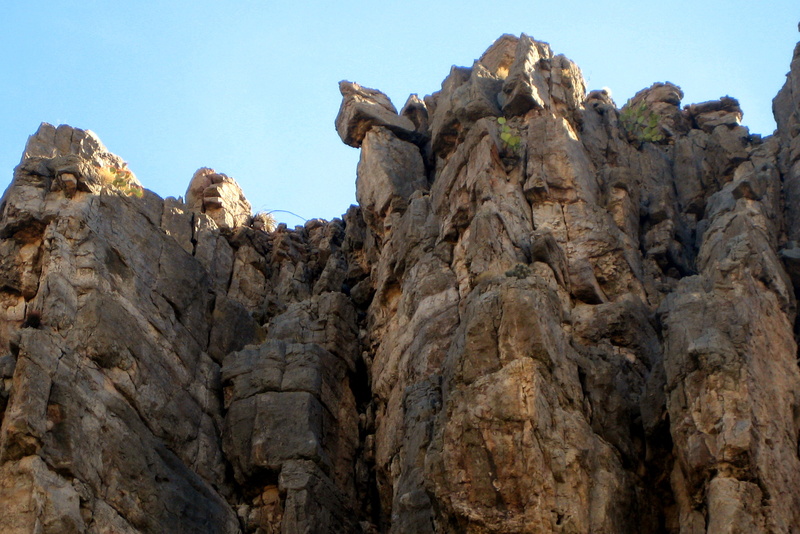 We spent part of one day driving up into the Chisos Mountains near the center of the park. The road, although paved, was steep and winding. Now Kit does not like steep and winding……probably as a result of the ill-fated trek up to Jerome, Arizona on last year’s trip or maybe the climb up into Oatman, Arizona she endured the year before that. Anyway I tried to placate Kit’s fears by explaining that this road was paved, there were guard rails at all the hairpin turns and that at least we were not pulling the trailer as in the past. However Kit was having none of that and devised her own method to enjoy the ride as well as the lofty overlooks we encountered at every turn. Well, she made it…..and what a trooper. 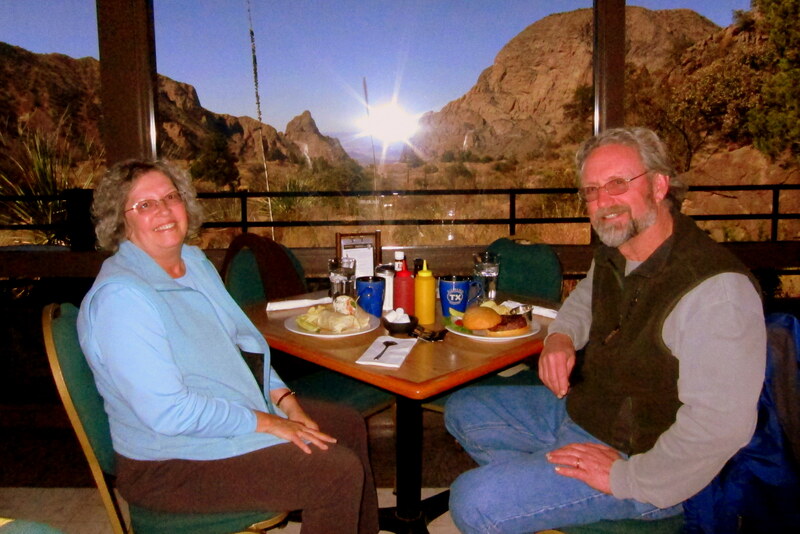 As a way of acknowledging her courage and thanking her for at least putting up with my desire to see what’s up the road we enjoyed an incredible lunch at the Chisos Mountain Lodge, a CCC built structure that has been catering to the traveling public since before the park was established. The sandwich I have on my plate is actually a Bison Burger and it was incredible. Kit enjoyed a Chicken Wrap (no pun intended). The young fellow who waited on us spends half the year working at the lodge. Then come summer he heads north to work as a sea kayak guide in Alaska’s Glacier Bay National Park. Being that we were his only customer he spent quite a bit of time telling us of his life and we talked a great deal about kayaking. 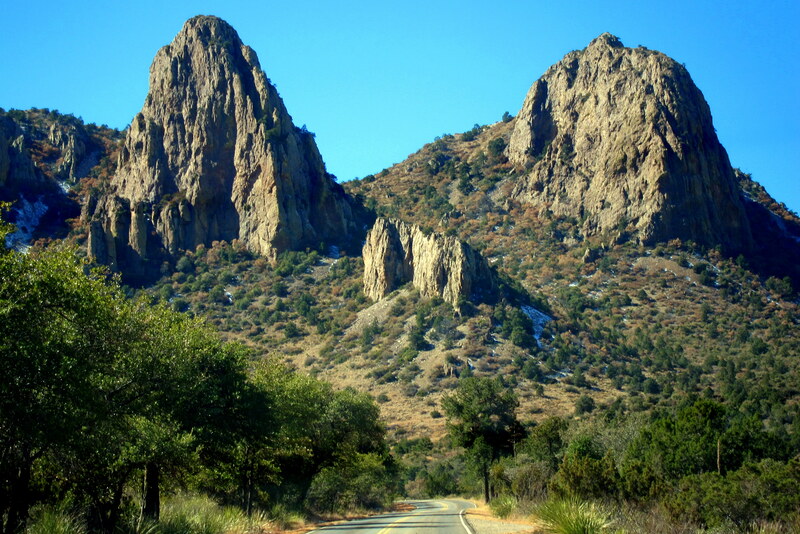 The Chisos Mountains are a green oasis in the surrounding arid desert. At 7,800 feet this semi-alpine environment supports pine, fir, cypress, oaks and even maple trees. It was cool up in the mountains and the shady areas still contained snow from last week’s storm. The views and scenery were incredible. There is a campground in the mountains but it is limited to tents or small van type (class B) motorhomes. My bruzzin Dewey and bruzzin-in law Bea camped here last summer and reported fantastic hiking in the area. 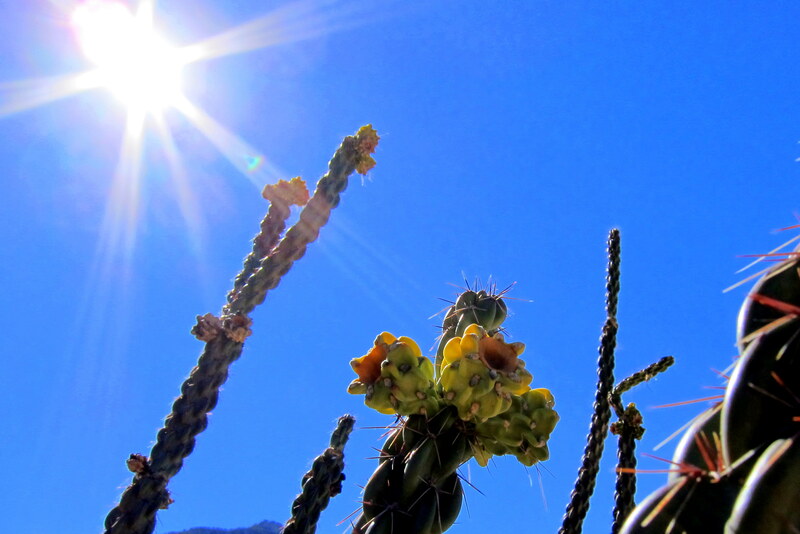 When it approaches 100 degrees on the desert floor, it is a comfortable 80 degrees here in the mountains. Before leaving Chisos Basin, we had a nice chat with the ranger in the visitors’ center who gave us a line on what to see. As it turned out, he spends his summer as a park ranger at Acadia National Park up home way. On another day, we spent time enjoying the Ross Maxwell Scenic Drive which leads to the small village of Castolon and the historic La Harmonia Trading Post. While driving along the scenic drive we noticed a large cat paralleling the road for about 30 yards before darting back into the sagebrush. Describing the encounter to the park ranger at Castolon he said we likely spotted a mountain lion, a rather rare occurrence. He asked us to fill out a Wildlife Spotting Report with the information on what we witnessed and our names and address. It was all pretty exciting. All along this beautiful byway we stopped to snap photos of the terrain and plant life. The little store in the village in Castolon was established in 1922 to support the cavalry troops that patrolled the border on the lookout for Mexican bandits. The proprietor named his store La Harmonia in order to lend it an international feel and to help promote harmony between the US and Mexican citizens that inhabited the area. While exploring the western edge of Big Bend we stopped to check out the third campground in the park. Cottonwood sits west of Castolon near Santa Elena Canyon. Like the Rio Grande Village campground, it too sits near the river and provides only dry camping. It also features an excellent access point for a 118 mile multi-day river camping adventure downriver to Rio Grande Village. 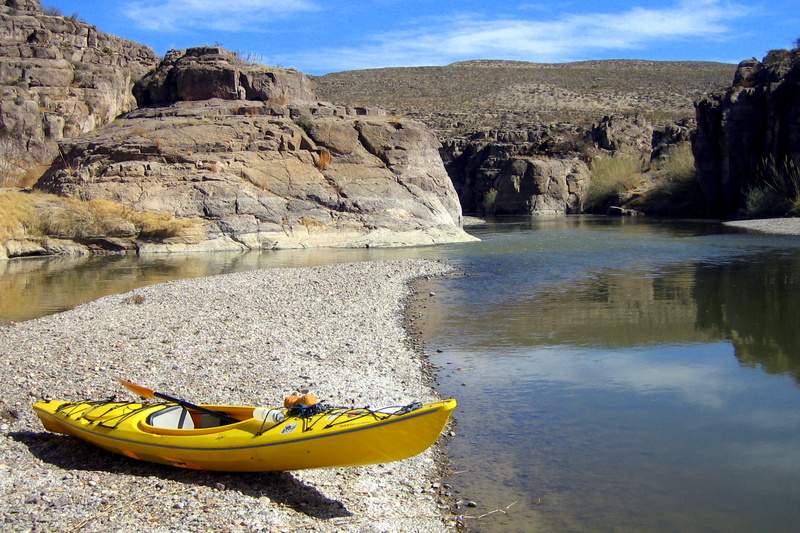 The Rio Grande Trip is a classic wilderness camping opportunity as one paddles the river which makes the large u-turn that gives Big Bend National Park its name. The Rio Grande’s source is the Colorado River, which is a mere trickle by the time it makes its way to the border and Mexico’s Rio Concho which provides the majority of the rivers flow. 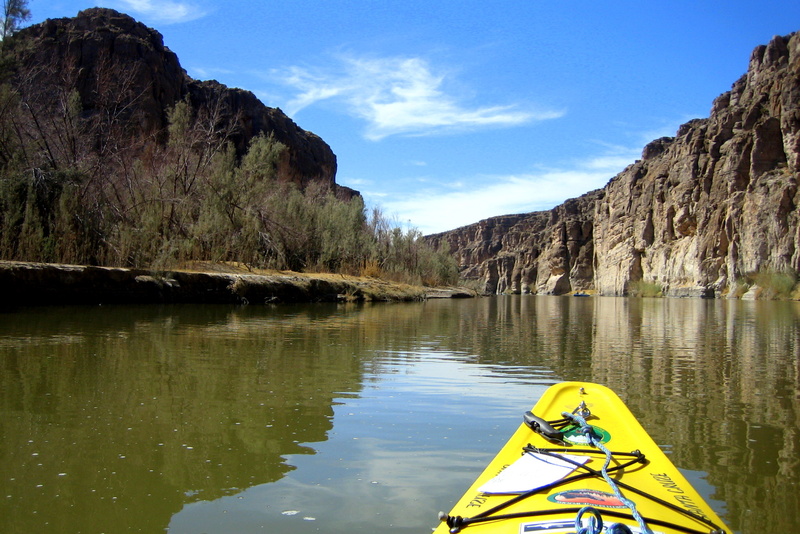 Like other rivers, the Rio Grande has carved deep canyons over the centuries and has created a fertile floodplain that supports animal life and human settlements. The day we visited Cottonwood campground there were even fewer folks camping than at Rio Grande Village. In addition to the three intrepid and hardy souls that set up camp here was this inquisitive and voracious fellow. 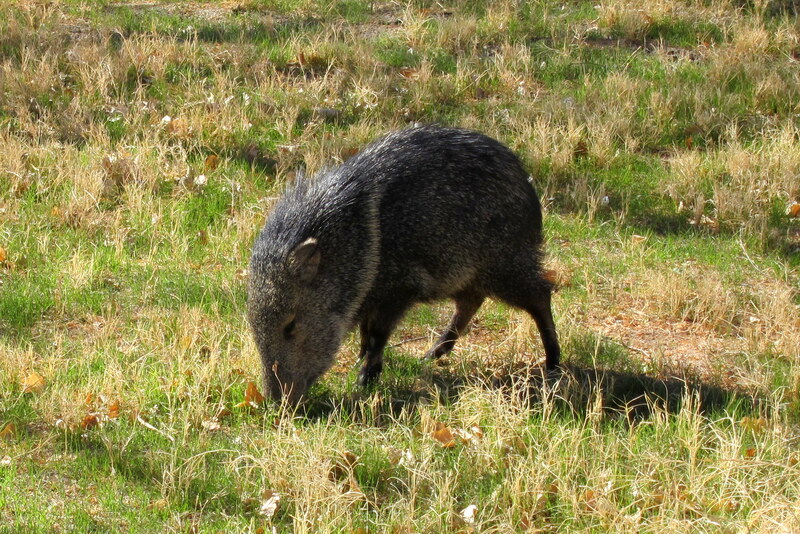 That folks is a Javelina…..a rather mean and nasty wild animal that resembles a pig. Like Yogi in Yellowstone National Park, Piggy has a way of getting into ones food stash. All hardened campstites in the park have armored food enclousures to thwart the Javelina’s foraging. The critter is mostly head and the head is mostly teeth. The body is like a tank and those stubby little legs can move the beast at a pretty good clip…..don’t ask how I know this. On the final full day in the park, Kit needed some quiet time and “strongly suggested” I go somewhere outside and play. 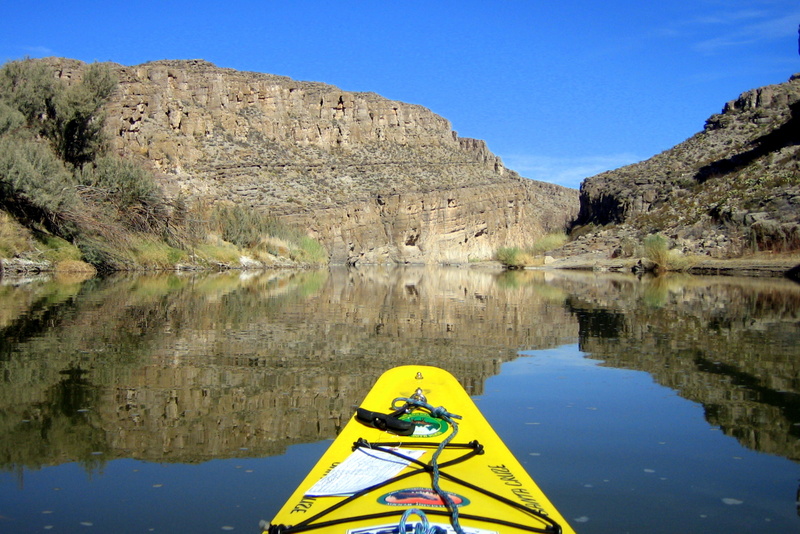 So never missing an opportunity to paddle a new river I headed to the Rio Grande. After pulling a river permit from the ranger’s office I set out to paddle up river toward Hot Springs. The flow at this point was light and the paddling was easy. Now I have done a lot of river paddling but this felt kinda weird……I had the entire United States to the right of me and the entire country of Mexico to the Left. 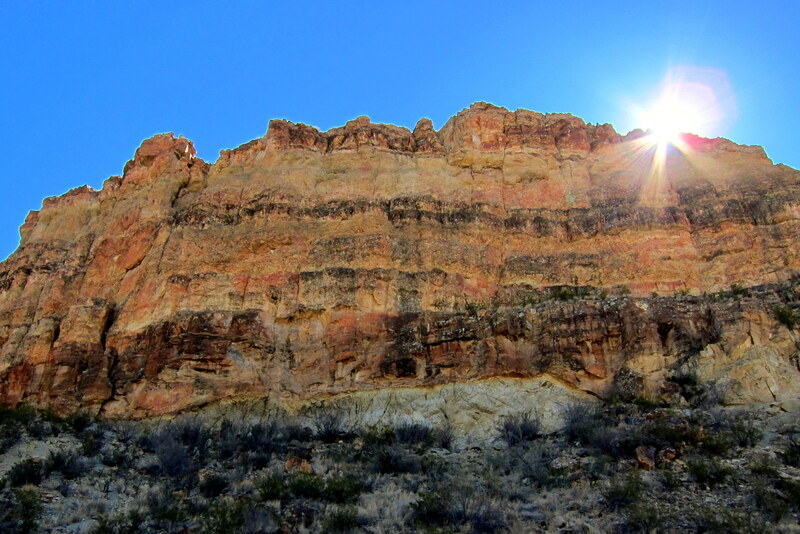 The canyon walls were very tall and quite imposing. There were many places where large menacing rocks overhung the river. 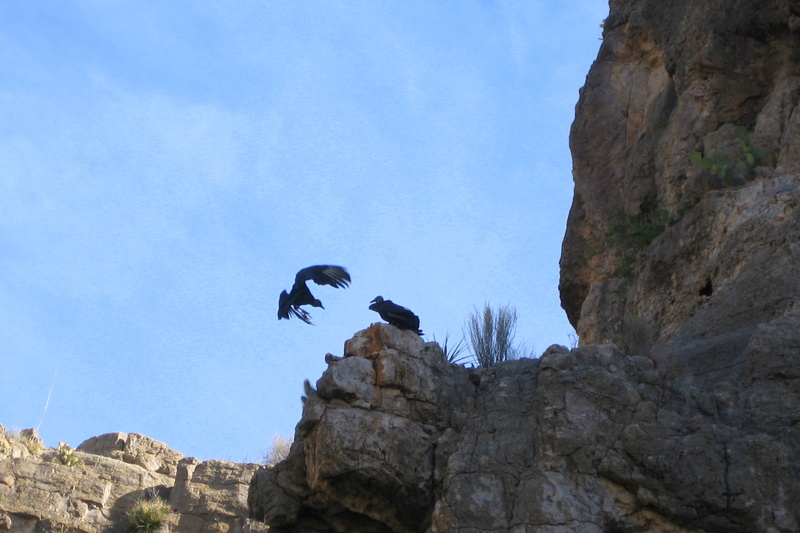 At one point I stopped to watch and photograph a hawk up on its lofty perch high up the canyon wall. Photo luck allowed me to capture its mate as it returned to the nest. I soon encountered a bit of quick water which I was able to paddle through followed by a second set of rips that I had to eddy out and walk around. 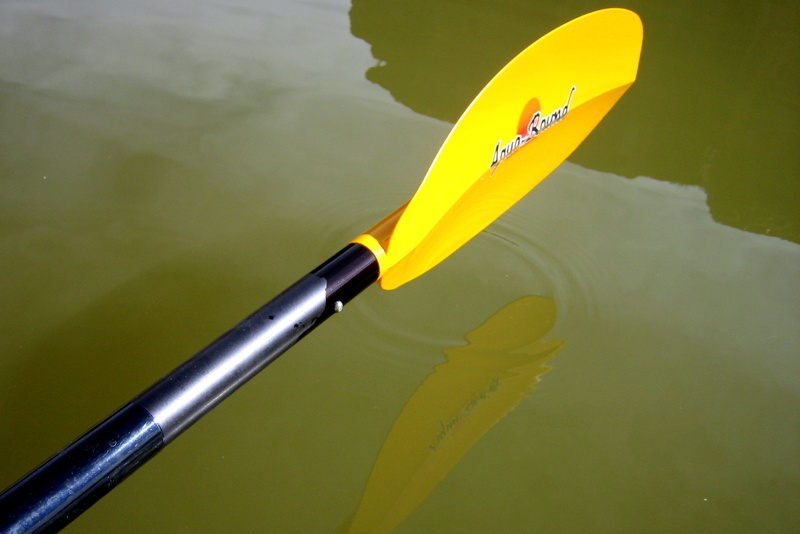 It wasn’t that the current was that strong it was just too shallow to get a good paddle stroke so I kept sliding backwards. 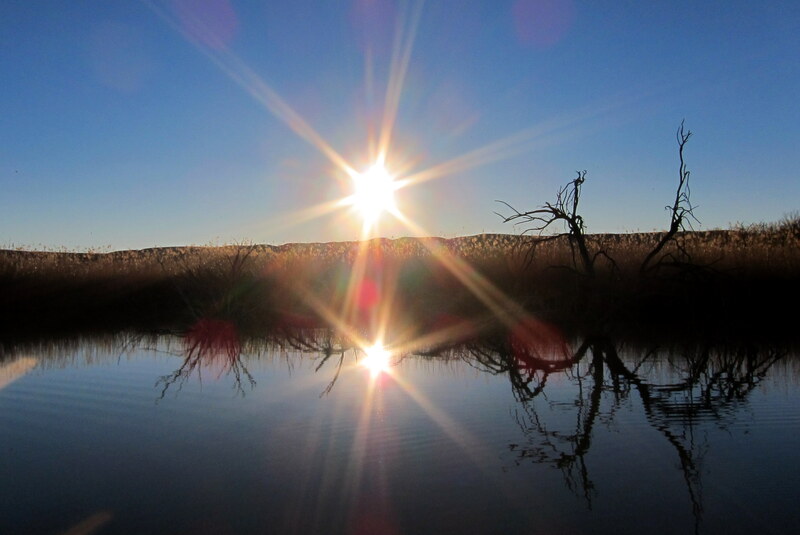 The third set of rips did me in…..no sooner than I entered the quick water then the current caught my bow, spun the boat around and I headed for Mexican soil. Now, before I could acquire a river permit from the park service ranger I had to read two pages of what not to do. Number one rule was “Do not make landfall in Mexico”! Fearing I would be captured by the Federales and end up in a Mexican prison with some dude named Big Pedro, I quickly grabbed handfuls of river bottom to slow my speed. Regaining my composure I tried a second time with the same result. So, since the US side of the river at that particular location was a 200 foot vertical wall I decided to end my quest for the fabled Hot Springs Pool and head back down river. I decided to allow the river current to carry me along so I could relax and scan the cliffs for anything of interest. 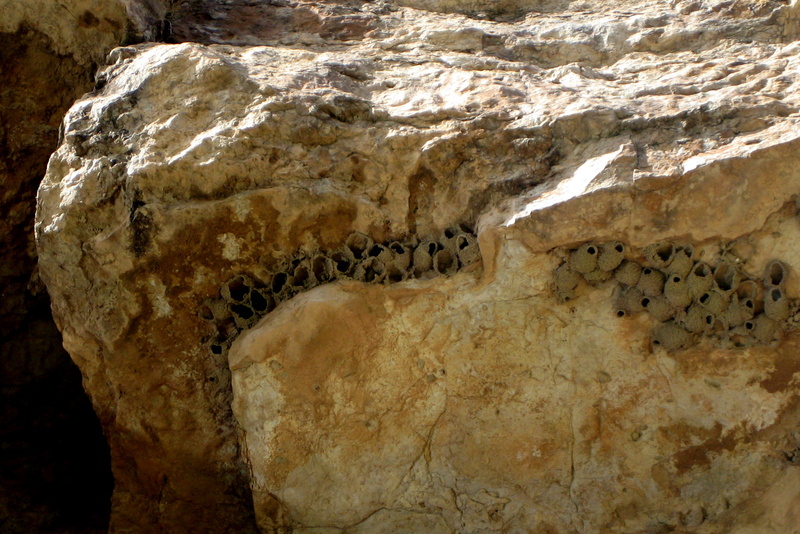 I spotted a cluster of nests built by Cliff Swallows high up on the canyon walls. There was movement in a few of the nests but I never did see any birds about. I did, however come upon these fellows lazing about in the afternoon sun. 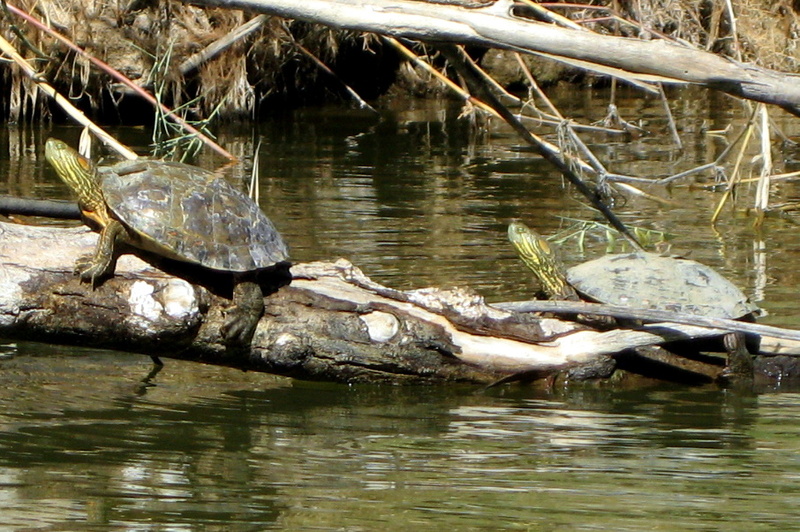 At my slow pace I was able to study the river for any signs of fish. The water was a rather unique shade of green and not at all like the blue hue of the water on the rivers back home in Maine. In addition, the water was very opaque. If there was any fish, I sure wasn’t able to detect them. Passing the point I departed a few hours ago I decided to float down river some distance. I came to another section of quick water and not seeing anything of interest so far, I turned the boat around and headed for home. As the sun sets across the Rio Grande on our final night in the park we both vowed to return and continue our exploration of this incredible American gem. 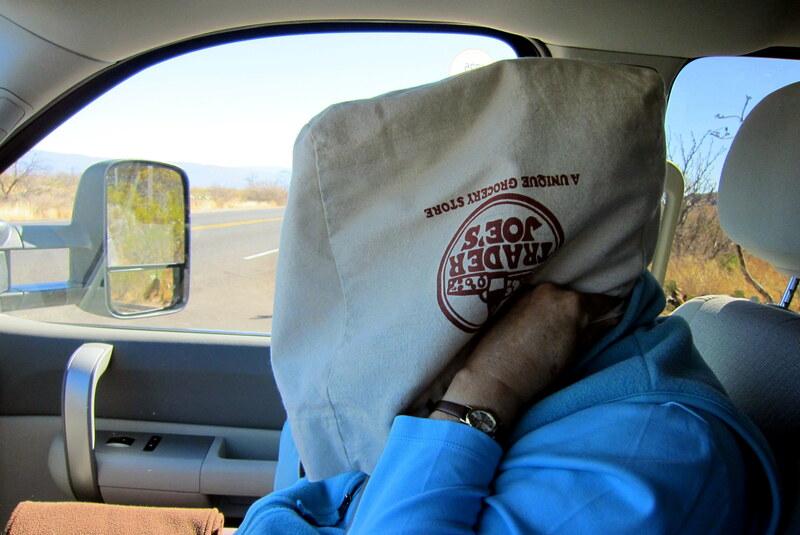 Kit’s Corner: We had a real nice time in Big Bend NP. I was not too sure about going that far south but it turned out to be a good call. Like Death Valley last year, I had no idea how picturesque it would be. Very happy we finally got to see the park. Most of our time there, the daytime temps were in the 80’s. The morning we left, the temp and dropped overnight to 18 degrees! Whoa! What happened? I had to dig out my parka again. Once again – good wildlife Bill. 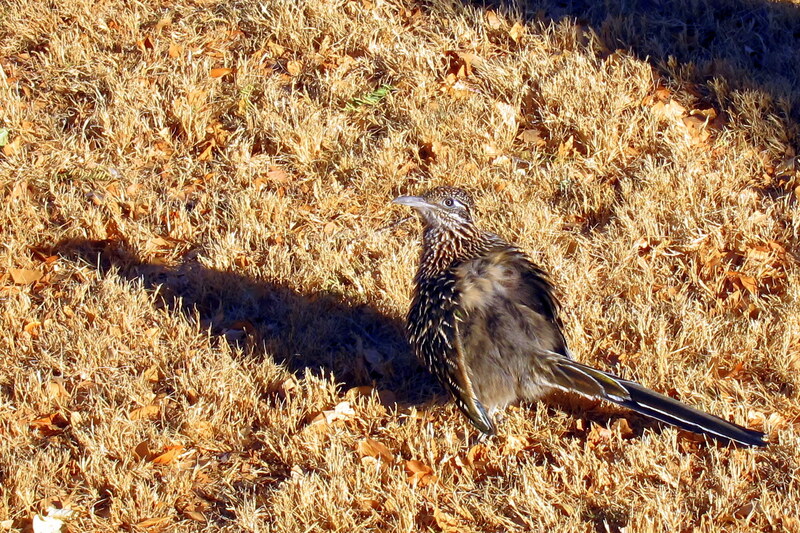 I agree with the Road Runner warming itself in the sun. Great Coyote and Javelina and the others also. You are coming right along with your nature stuff. Glad you did not make it to Mexico. I’d would have had to come get you. 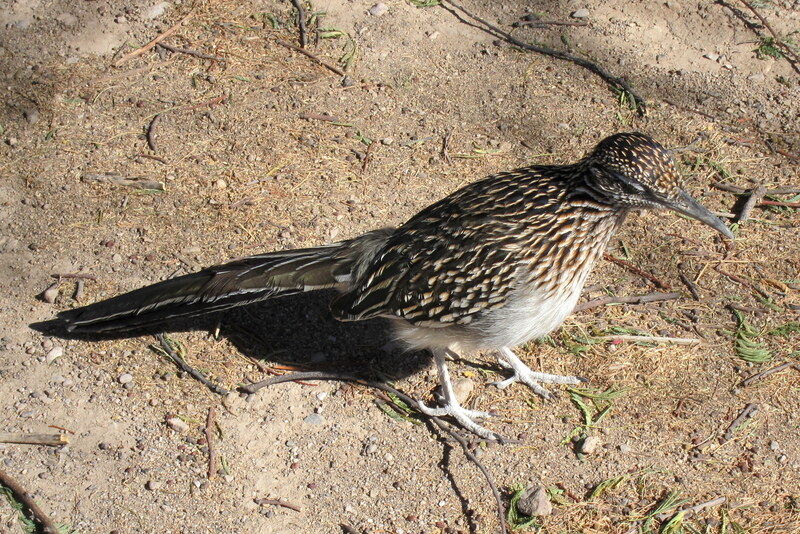 I prefer to believe the roadrunner was doing a victory dance! Love the pics as always!! AND..the stories! Did you buy any cheap trinkets from that grizzled old Gringo inside the Jacal. Who is that poor child you kidnapped then hoodwinked from Trader Jose’s. Man vs. Wild had a Tex-Mex border story. The US Gummint knows where you are. They have sensors all along, below, above the border tracking you. That was actually his survival plan, he knew that if he made it to the Rio, a BP agent would quickly come investigate, and save him.Whatever you do, do not tell them your name is Guillermo. Make something up like Chetti or Jamey.